Carbon dioxide is a product of respiratory and fermentative metabolism of micro organisms. During fermentation the carbon dioxide emission correlates with the biomass concentration and the substrate consumption. Depending on concentration carbon dioxide may influence the growth and metabolism of micro organisms. For example a high concentration of carbon dioxide leads to a delay of budding of Saccaramyces cerevisiae, so the reproduction of yeast is influenced negatively. Further the negative effect of a very low carbon dioxide concentration on the metabolism during aerobic substrate limited yeast fermentation is well known and results in a yield loss. Also the formation of products and by-products in fermentation processes frequent depends on the content of carbon dioxide in the medium. Continuous detection of carbon dioxide by the presented measuring system is realized by combination of a silicone-tubing-probe and a carbon dioxide sensor. The silicone-tubing-probe was developed by BIOTECHNOLOGIE KEMPE GmbH (EU and US patent). It is steam sterilizable. The probe inserted into the broth consists of a silicone coated channel which is flown through by a carrier gas. Carbon dioxide permeates through the silicone membrane and is carried to the CO2-sensor. The measuring principle of the system bases on the linear relation between the partial pressure of carbon dioxide inside the broth and the amount of carbon dioxide permeating through the membrane. The concentration of CO2 in the carrier gas is far from the equilibrium concentration so that permeation back from the carrier gas into the broth is negligible. The carrier gas control and the signal converter are located inside a separate box. The gas is measured by its absorption of infrared radiation inside the CO2-sensor located in the housing of the ST- probe. Infrared radiation emitted by a lamp passes through a filter working at the selective wavelength which is characteristic for absorption by carbon dioxide. 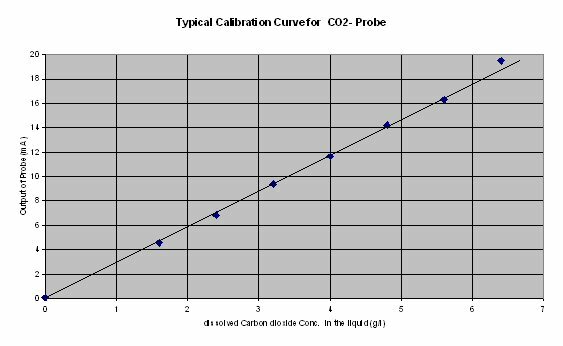 If there is carbon dioxide inside the measuring cell the intensity of light decreases corresponding to the actual CO2-concentration. The described ST-probe is equipped with a modular CO2-sensor. The CARBOCAP sensor is silicone based and its operation is based on the NDIR Single-Beam Dual-Wavelength principle. Basing on this new measuring principle the main advantages of the sensor are long-term stability and long lifetime. The output of the sensor (Signal Converter Module) is 0(4) - 20 mA and a serial interface RS- 232 is available. Additional signal processing is realised by connecting the CO2 probe to a measuring computer FMC-MINI LCD. This is a modification of an existing measuring computer which is successfully used in Biotechnology to detect volatile organic compounds. The system to measure carbon dioxide is now a new development of BIOTECHNOLOGIE KEMPE GmbH. The carbon dioxide concentration in the carrier gas is shown as % Vol. after processing by the computer. Based on the detected concentration in the carrier gas the computer calculates the partial pressure of CO2 in the fermentation broth. The next step is the calculation of the dissolved CO2 by means of the additionally measured temperature. Influence of other compounds on the solubility of CO2 can be compensated by means of the computer programme. The measuring computer realizes the collection of values, processing, calibration and graph. 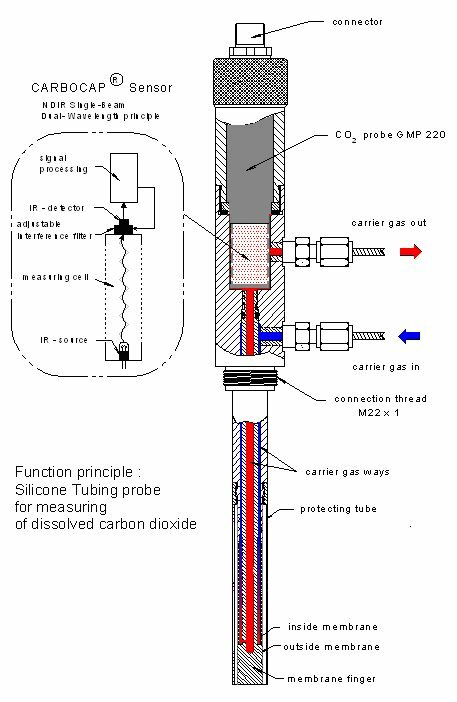 Several CO2-probes are offered for measuring the dissolved carbon dioxide concentration by the described principle, in accordance to the measuring range. The measuring range is fixed by the carrier gas flow rate which depends on the used nozzle. Depending on the chosen nozzle a measuring range of 0-50% or 0-100% of saturation can be realised. This probes are offered for using during no-pressure fermentation. Furthermore a probe is offered which covers a range of 0-500% saturation, used during pressurised fermentations. to realise the control of anaerobic fermentations. Furthermore carbon dioxide plays an important role as a quality parameter in beverage and brewery industry. It can be detected by the measuring system in order to insure the quality of the final product.